If anyone knows me well, you’ll know I’m not a big phone person. I tolerate a cell phone because Jeff insists I have one. His biggest pet peeve is when we get in the car, drive for a couple blocks and then I say “Oh, I forgot my phone.” Drives him nuts. My thought is, really… do I need a phone when I’m with him anyway??? I know, I know… you’re saying to yourself “what if you get separated? ?” This has happened. It’s in those moments that I do wish I had remembered the phone, but I don’t get nearly as bent out of shape about it as Jeff. Personally, I miss the days of just having a phone hooked to the wall and that’s where it stays. You don’t know who is calling, there is a surprise every time you pick up the receiver. If I had my choice, that’s what I would have- a phone connected to the wall with a cord to the receiver. Old fashioned… yes. That’s how I roll people. Cover a cookie sheet with aluminum foil. Place a glass upside down in the center of the cookie sheet. Roll out crescent rolls around the base of the glass, with pointy ends away from the glass; when you’re finished, the arrangement will look like the sun. 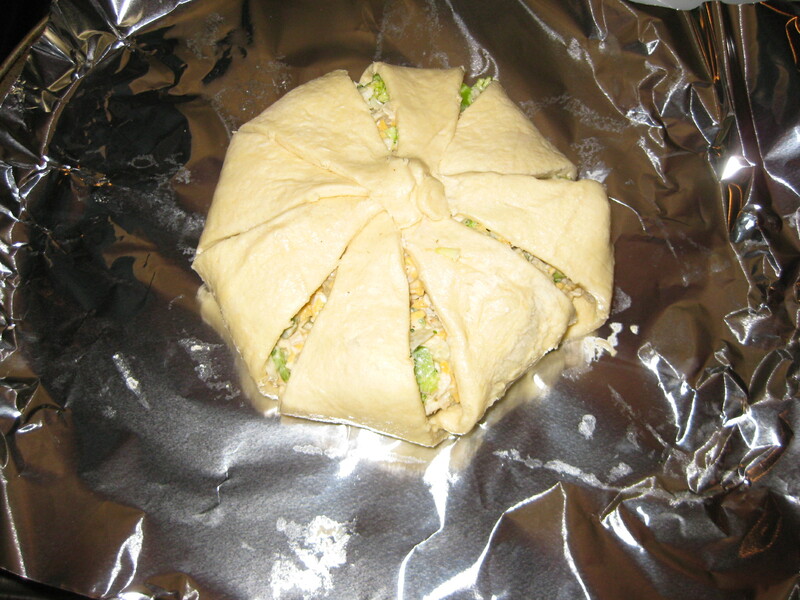 Spoon some of the chicken mixture onto the thick part of each crescent roll. Fold the pointy end of each roll over the top of the mixture and tuck in the middle. Remove glass from cookie sheet. Arrangement of rolls will now look like a fluted tube cake. 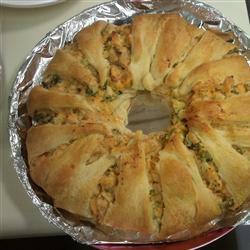 Several of the comments for this recipe stated that there was too much filling for one package of crescent rolls and three packages were needed; other comments said they didn’t know why people were complaining about too much filling and you just had to pile it on and it worked. So with this in mind, I bought two packages. I would say two is a good amount. I wouldn’t have been able to get all of my filling into one package of rolls, so two worked well for me. After my two variations, I found that the first roll (made as directed) needed more crescent. The second roll was good, but not very much filling. So a combo of the two would be perfect next time. The directions say to back at 400 degrees for 30 minutes. Several people said that their rolls burned after 15 minutes at this temp. 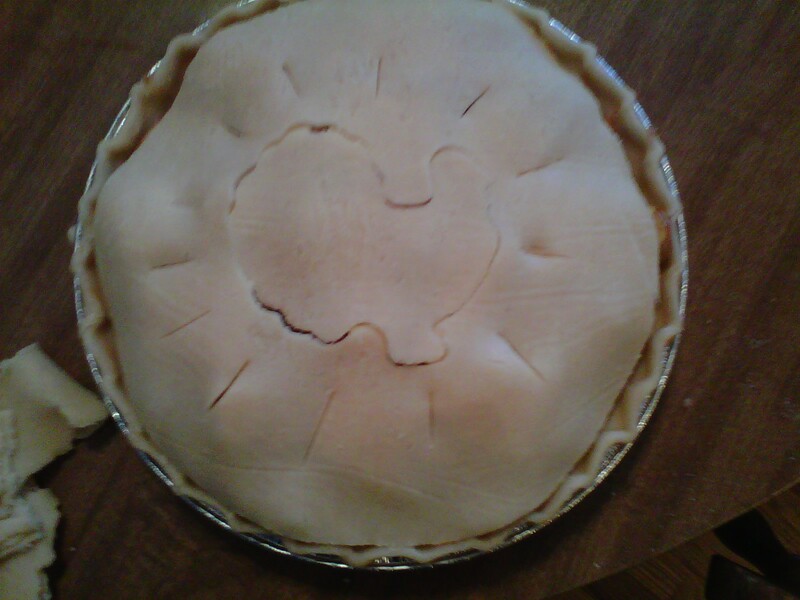 I decided to go with the crescent baking directions. I baked mine at 375 for maybe 20 minutes?? (I can’t really remember now how long). I was baking both rolls so that probably made a difference too. I wanted to make sure it baked long enough for the broccoli to cook. I think I put too much garlic or onion in mine. Jeff said he liked the flavor, but there was too much of something for me. I liked trying something different! 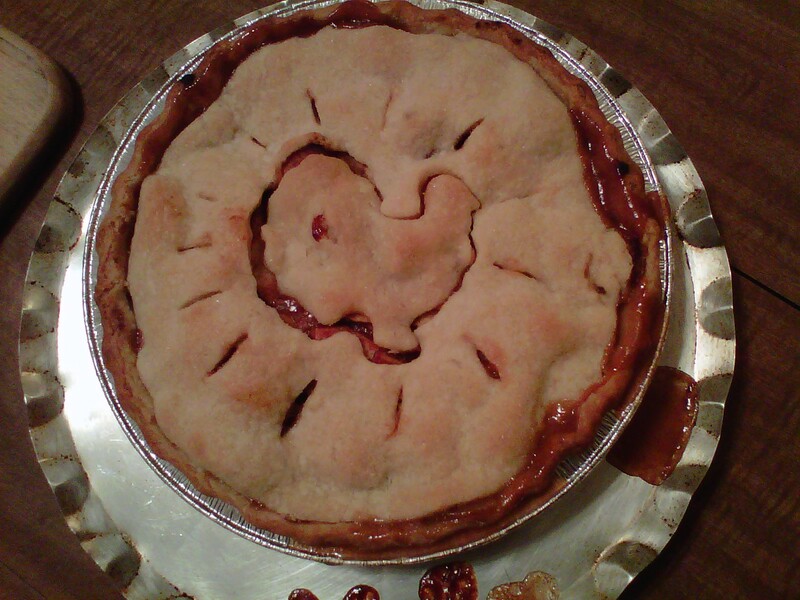 It was fun trying to figure out how to lay out the crescents and wrap the filling. 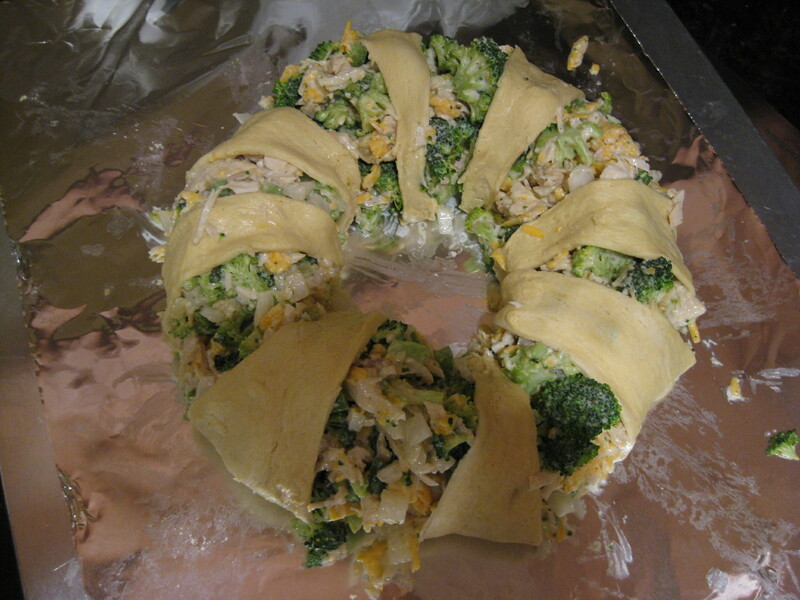 This was a fun recipe, but I think next time I will need to figure out something other than crescent rolls to use for the wrap. Other than that, it was a success! Hope you like it too. If you read last week’s post about my chicken enchilada turned Philly Cheese Steak debacle, you may have guessed what this week’s recipe was going to be. Yep, Chicken Enchiladas. Since I had the chicken all thawed out for this recipe, the only thing to do was to find the right day to make them before the chicken started to go bad. I figured Sunday was just the day. In a 3-qt. slow cooker, combine the chicken, enchilada sauce and chilies. Cover and cook on low for 8 hours or until a meat thermometer reads 170°. To use frozen enchiladas: Thaw in the refrigerator overnight. Remove from the refrigerator 30 minutes before baking. Bake as directed. Yield: 4 servings. Number 1 started off great. I got the chicken, enchilada sauce and chilies in the slow cooker by 8:30am. Turned the sucker on and went about my day. I should note here that these Enchiladas were going to be for Monday’s dinner and we were out for part of the afternoon/evening which is why I forgot about them until about 9pm!! As I was laying on the couch, getting ready to head to bed, all of the sudden I realized I had totally forgotten about my chicken enchiladas in the crockpot!! Sheesh! I bolt off the couch, my heart beating wildly because I didn’t want burned chicken. No fear… the chicken was wonderfully tender and fell right apart. PS- I used green enchilada sauce and it was DELICIOUS!! Reserve juices and pour remaining in a large bowl: because it was 9pm I think I may have been a bit delusional because I poured ALL the remaining juices into the chicken bowl! I stood there looking at what resembled chicken soup and wondered how that could be right.“Geez, these are some runny enchiladas…” I stirred things up a bit hoping… I don’t know… that it would thicken?? It took a minute to realize I had messed up. I think it actually worked out OK though. I ended up straining the enchilada sauce out of the chicken with my mesh strainer. However, this mishap made the chicken extra tasty. I may do this again next time just to get some extra flavor into the chicken! Number 3: After mishap one and two, I read direction number 3, 4, and 5 very carefully and am glad to report all went well. I think it was smooth sailing after that. While it may not seem like it from my experience, this was a super easy recipe that even the most novice cook would be able to handle. It was super delicious! Sooo GOOD!!! Other than my inability to read directions carefully, there were no low points. I heated these enchiladas as directed for dinner Monday night and they were wonderful. Jeff really liked them a lot, I really liked them a lot and Ava liked them too. These will definitely be a repeat sometime in the future! This week I had a near disaster at dinner time. 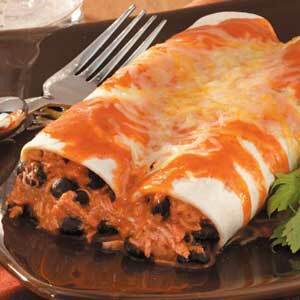 I had my week’s meals all planned out and Thursday night had I had decided would be chicken enchilada night. That was going to be my new recipe of the week and I was pretty excited about it. Around noon I took my chicken out of the freezer to thaw out and didn’t come back to it until about 5:00. That is when panic struck. As I read through my recipe, I quickly realized I had a MAJOR problem on my hands. The enchilada recipe was a crock pot recipe and my chicken was supposed to have been cooking for the last 8 hours. Aaauuuuggghhh! How the heck did I miss that somewhat significant detail?!?!? A wave of panic swept over me. Now what?!?! Since it was the end of October, I had already spent all of my grocery money (except for $2… I had two lonely dollar bills left in my wallet. That will hardly buy you a pack of gum these days…) I couldn’t just run to the store for something else. I had to come up with a new plan… stat! I ran through all my options in my head. The only one that seemed even remotely viable was a Philly Cheese Steak. I still had some unused beef left over from the fajitas that I made for Week 39 in the freezer and had planned to try a Philly with that. Plus I luckily had some hoagie rolls frozen as well. It could just work… hopefully. I still had to find the right recipe. I raced to Google and after only about 5 minutes, found the following recipe. It was PERFECT because it calls for the meat to be frozen (which is exactly what I had). A quick trip to the grocery to pick up $1.45 worth of mushrooms and I was on my way. The website I found for this week gives a neat little history on the Philly Cheese Steak. If you’re a food history buff, this is right up your alley. The site is called whatscookingamerica.net which I thought was fun. You can see the original recipe as well as the history info by clicking HERE. 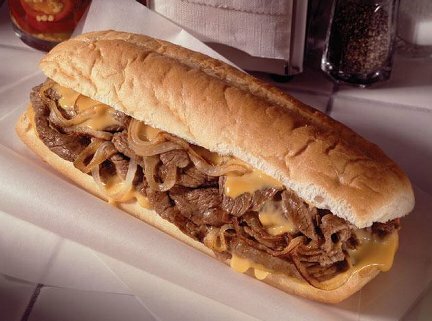 Hope you enjoy this week’s Philly Cheese Steak! ** Freeze steak before slicing. Slice it paper thin. In a large frying pan over high heat, add oil and heat so that a drop of water will sizzle when you drop it in the oil; lower heat to medium. Add onions and mushrooms, stir and cook until mushrooms darken and onions start to look transparent. Add steak slices and cook for 3 minutes or until meat lightly browns. Add salt and pepper to taste. Heap cooked meat mixture in a long pile across pan. Lay cheese slices over meat until melted. If using Cheese Whiz, melt in a double broiler or in the microwave. Slice bread lengthwise. Using a spatula, scoop meat mixture and cheese and lay on bread with cheese on top. If using Cheese Whiz, ladle it on top. Serve with a dill pickle. I have lots of tips this week so bare with me! First off, regarding the meat. Since I only had flank steak that’s what I used. And it was tasty. I’m sure there is some difference between steak cuts but I’m not aware of what they are. You’d probably need a boy to tell you about that. Since I conveniently had frozen meat fresh from the freezer I started right off trying to slice it. I didn’t get very far. It was too frozen. Perhaps if I had an electric knife I would have had better luck, but I just had good old fashioned elbow grease and a sharp knife. So I decided to defrost the meat in the microwave for about 4-5 minutes. This worked beautifully. The meat was still frozen but not rock hard. I was able to get some pretty thin slices which I later realized was VERY important. You have to have super thin slices (paper thin as the recipe says) or your meat will be chewy. The meat package I had was 18 oz. I got 4 really good sized sandwiches out of this. The original recipe says you’ll only get two if you follow the directions as is. I would use at least 1lb. After cooking everything and adding the meat, I tasted it to see if it needed more seasoning. I decided to add one cube of beef bullion to the mixture for a little more flavor. That was just the ticket! Yummm!! I read this trick on another recipe that I had looked at before finding this one. I pre-heated the oven to 350. Instead of adding the cheese (I used Provolone) to the meat mixture in the pan, I loaded up the hoagies and placed the cheese on top. I wrapped the sandwiches in tin foil and put them in the oven for 10 minutes. This was such a fantastic idea! The cheese melted so wonderfully and I had two neat little sandwiches all ready for the refrigerator. Don’t scrimp on your mushrooms and onions. When I was chopping everything up it looked like a lot, but everything cooks down quite a bit. I probably added more than the recipe called for. This was a super easy recipe! Considering the chaos at the begin, it didn’t take very long to pull this all together at all! The sandwiches were delicious! So good. Jeff thought they were restaurant quality. That’s what I’m going for people. I don’t usually have steak sitting around in the freezer. We loved these Philly Cheese Steaks. And since the seasoning is just salt and pepper (and a beef bullion cube), they are a simple easy meal to pull together. We’ll be having this again!